A painting depicting the four sights. 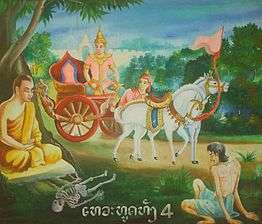 The four sights are four encounters described in the legendary account of Gautama Buddha's life which led to his realization of the impermanence and ultimate dissatisfactoriness of conditioned existence. According to this legend, before these encounters Siddhārtha Gautama had been confined to his palace by his father, who feared that he would become an ascetic if he came into contact with sufferings of life according to a prediction. However, on his first venture out of the palace with his charioteer Channa, he observed four sights: an old man, a sick man, a corpse and an ascetic. These observations affected him deeply and made him realize the sufferings of all beings, and compelled him to begin his spiritual journey as a wandering ascetic, which eventually led to his enlightenment. The spiritual feeling of urgency experienced by Siddhārtha Gautama is referred to as saṃvega. After the birth of the Prince Siddhārtha, King Śuddhodana called upon eight Brahmins to predict his only son's future. While seven of them declared that the prince would either be a Buddha or a great King, the Brahmin Kaundinya was confident that he would renounce the world and become a Buddha. Śuddhodana, who was determined that his son should be a great king, confined the prince within the palace and surrounded him with earthly pleasures and luxury, thereby concealing the realities of life that may encourage him to renounce these pleasures and become an ascetic. After leading a sheltered existence surrounded by luxury and pleasure in his younger years, Prince Siddhārtha ventured out of his palace for the first time at the age of 29. He set off from the palace to the city in a chariot, accompanied by his charioteer Channa (Sanskrit: Chandaka). On this journey he first saw an old man, revealing to Siddhārtha the consequences of aging. When the prince asked about this person, Channa replied that aging was something that happened to all beings . The second sight was of a sick person suffering from a disease. Once again, the prince was surprised at the sight, and Channa explained that all beings are subject to disease and pain. This further troubled the mind of the prince that none can stay healthy and live a pain free life. The third sight was of a dead body. As before, Channa explained to the prince that death is an inevitable fate that befalls everyone. After seeing these three sights, Siddhārtha was troubled in his mind and sorrowful about the sufferings that have to be endured in life. After seeing these three negative sights, Siddhārtha came upon the fourth sight; an ascetic who had devoted himself to finding the cause of human suffering. This sight gave him hope that he too might be released from the sufferings arising from being repeatedly reborn, and he resolved to follow the ascetic's example. After observing these four sights, Siddhārtha returned to the palace, where a performance of dancing girls was arranged for him. Throughout the performance, the prince kept on thinking about the sights. In the early hours of morning, he finally looked about him and saw the dancers asleep and in disarray. The sight of this drastic change strengthened his resolve to leave in search of an end to the suffering of beings. After this incident and realizing the true nature of life after observing the four sights, Siddhārtha left the palace on his horse Kanthaka, accompanied only by Channa. He sent Channa back with his possessions and began an ascetic life, at the end of which he attained enlightenment as Gautama Buddha. In the early Pali suttas, the four sights as concrete encounters were not mentioned with respect to the historical Buddha Siddhārtha Gautama. Rather, Siddhārtha's insights into old age, sickness and death were abstract considerations. Analogous passages for illness and death follow. These passages also do not mention the fourth sight of the renunciant. The renunciant is a depiction of the Sramana movement, which was popular at the time of Siddhārtha and which he consequently joined. In the early Pali sources, the legendary account of the four sights is only described with respect to a previous legendary Buddha Vipassī (Mahāpadāna Sutta, DN 14). In the later works Nidanakatha, Buddhavamsa and the Lalitavistara Sūtra, the account was consequently also applied to Siddhārtha Gautama. 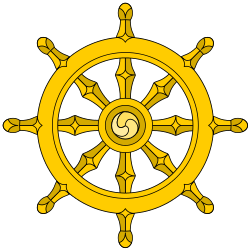 Some accounts say that the four sights were observed by Siddhārtha in one day, during a single journey. Others describe that the four sightings were observed by him on four separate occasions. Some versions of the story also say that the prince's father had the route beautified and guarded to ensure that he does not see anything that might turn his thoughts towards suffering. ↑ Keown, Damien; Hodge, Stephen; Tinti, Paola (2003). A Dictionary of Buddhism. Oxford University Press. p. 15. ISBN 0-19-860560-9. 1 2 "A Young People's Life of the Buddha by Bhikkhu Silacara". AccessToInsight. Retrieved 2014-07-18. 1 2 3 McFaul, Thomas R. (2006). The future of peace and justice in the global village. Greenwood Publishing Group. pp. 30, 31. ISBN 0-275-99313-2. 1 2 3 4 5 Trainor, Kevin (2004). Buddhism. Oxford University Press. ISBN 0-19-517398-8. ↑ Mehrotra, Chandra; Wagner, Lisa (2008). Aging and Diversity. CRC Press. p. 344. ISBN 0-415-95214-X. ↑ "Siddhartha Gautama". Washington State University. Archived from the original on April 3, 2008. Retrieved 2009-04-29. ↑ Cooler, Richard. "Buddhism". Center for Southeast Asian Studies, Northern Illinois University. Retrieved 2009-04-29. ↑ Gach, Gary (2001). The complete idiot's guide to understanding Buddhism. Alpha Books. p. 8. ISBN 0-02-864170-1. ↑ Siderits, Mark (2007). Buddhism as Philosophy: An Introduction. Ashgate Publishing Limited. p. 17. ISBN 978-0754653691. ↑ Buswell, Robert E. (2003). Encyclopedia of Buddhism. Macmillan Reference USA. p. 85. ISBN 0-02-865910-4.